I have always loved that song and New Years Eve has always been one of my favorites. Perhaps it is the new start, the fresh page on the calendar. Over the past several years, I have integrated more and more traditions from various cultures to start off the New Year on the right foot. I think it all started when I learned about the Italian tradition of breaking dishes at midnight. I am generally limited to how many of these traditions I can integrate because I’m traveling or attending some party, so in 2014 I decided to throw a dinner party and include as many as I could. 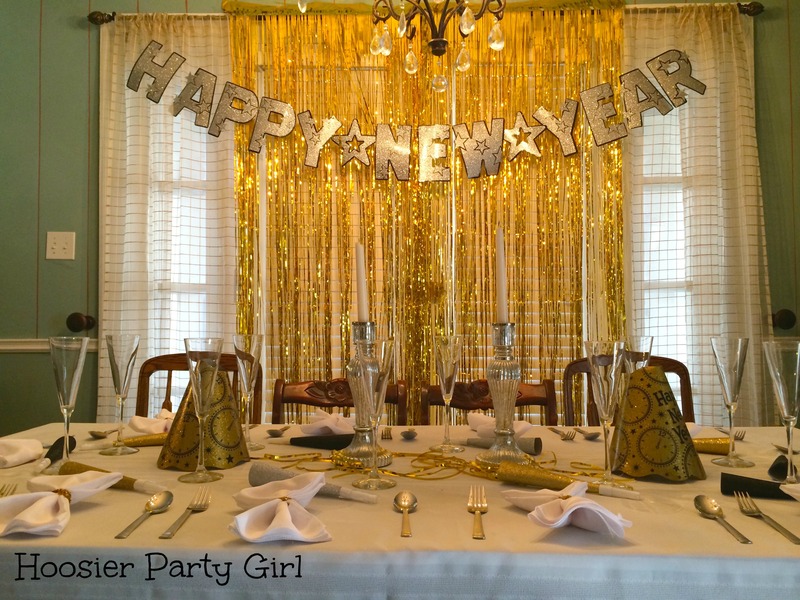 Decorating was easy with a couple of gold fringe curtains, pre-made New Years Eve banner, gold, silver, and black glitter noisemakers, and some party hats, I picked up on at a chain party store. I kept to the color scheme of gold, silver, black, and white. 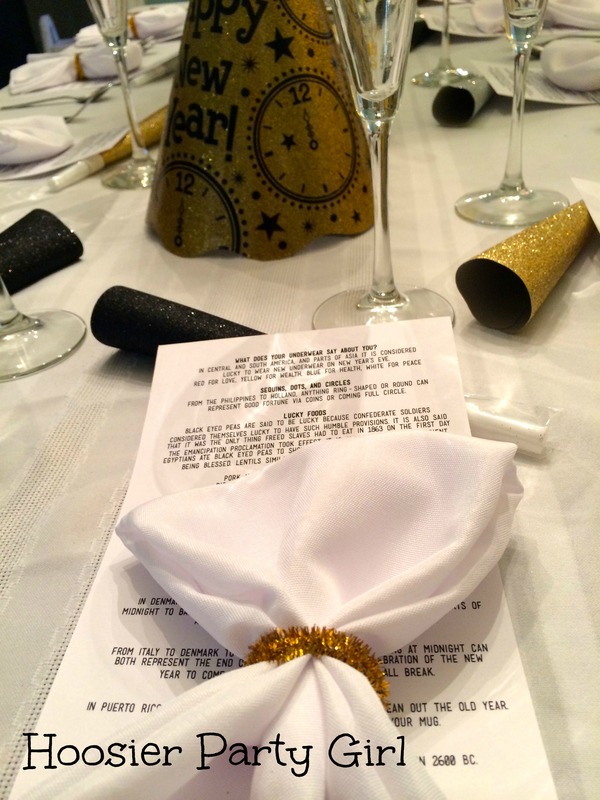 I used gold pipe cleaners to make napkin rings (and a cake topper), and I set each plate with a menu and educational materials. Rosemary Pork Chops braised in Sweet Apple Cabbage (recipe here) – While we enjoyed this recipe, my preferred pork chop recipe is below. 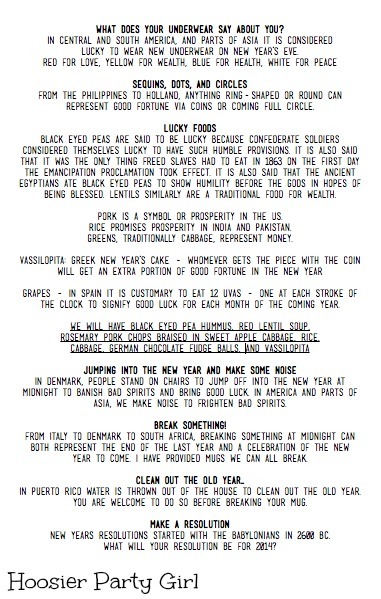 You can get a word copy of the menu and education materials here: NYE lucky traditions. This year may be more low key, but I will still shop for new underwear, I will still make pork and cabbage and black eyed peas and vassilopita, I will toast at midnight, and I will break a plate or a mug. I don’t measure things, but season well without adding too much salt. All the chops to rest while you melt bacon lard on high in a cast iron skillet (butter will also work). Cook chops on both sides for 1-3 minutes then turn heat to medium or medium low and cover the pan. They will cook for 5-15 minutes depending on how thick your chops are and how done you like them. You can also chop up some onion and apple and allow it to cook with the chops while they are on medium heat. You can do this simply in the juice of the meat or you can add up to a quarter cup of apple cider.